Home Life on the Water	Do you have what it takes to be a Boatanista? Do you have what it takes to be a Boatanista? Do you have what it takes to b e a Boatanista? It’s not the trademark. Or the boat with the name on the back. Or the colorful logo featuring waves and an oversized anchor. I am the Boatanista for one reason. It is in my DNA! I was a boater before I could walk. When other kids were riding tricycles I was learning to ski. I could handle a trailer before I had a driver’s license.But bein g a Boatanista is more a state of mind than a matter of experience or mastering a technical skill. To me, the definition of being a Boatanista is a woman who has the desire and drive to not only get on board but to take the helm. Do you have what it takes to be a Boatanista? I am calling on my fellow sisters of the waterways to join me in my quest to encourage, inspire and promote boating for women. It is one of my greatest joys to see the happy look on women’s faces when they discover how easy and fun it can be to take the helm. 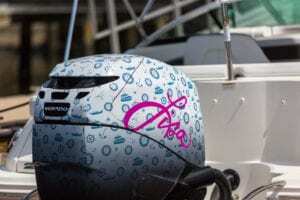 As a passionate advocate for the boating, I am a member of the Captains Club, The Jacksonville Power Squadron, The Jacksonville Marine Association, and I serve on the City of Jacksonville’s Boating Committee.Now, I’m looking for a few good women to join the ranks of Boatanista. 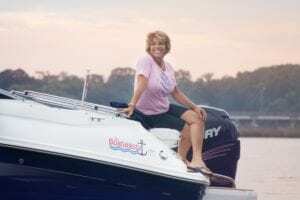 If you are a woman who has a passion for boating, and has a story to share, I’d love to hear from you. Email me at l.almeida@freedomboatclub.com. Own a Boat or Not? Don’t Quit!